The Thing is a fictional Character, a superhero that appears in comic books published by Marvel Comics. He is a founding member of the Fantastic Four. His trademark orange rocky appearance, sense of humor, blue eyes, and his famous battle cry, "It's clobberin' time! ", makes him a very recognizable comic book character. The Thing's speech patterns are loosely based on those of Jimmy Durante - More about Thing (Marvel Comics) Character Review...keep reading !! Michael Chiklis portrayed The Thing in the 2005 film Fantastic Four, and its 2007 sequel Fantastic Four: Rise of the Silver Surfer. 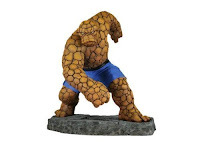 In 2011, IGN ranked the Thing 18th in the Top 100 Comic Book Heroes. 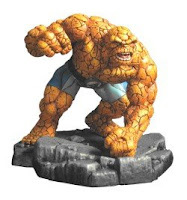 As a result of a mutagenic effect due to exposure to cosmic radiation, the Thing possesses high levels of superhuman strength, stamina, and resistance to physical injury. His strength has continued to increase over the years due to a combination of further mutation and special exercise equipment designed for him by Reed Richards. He is capable of surviving impacts of great strength and force without sustaining injury, as his body is covered with an orange, flexible, rock-like hide. He is also able to withstand gunfire from high caliber weapons as well as armor piercing rounds. It is possible to breach his exterior, however, and he does bleed as a result. 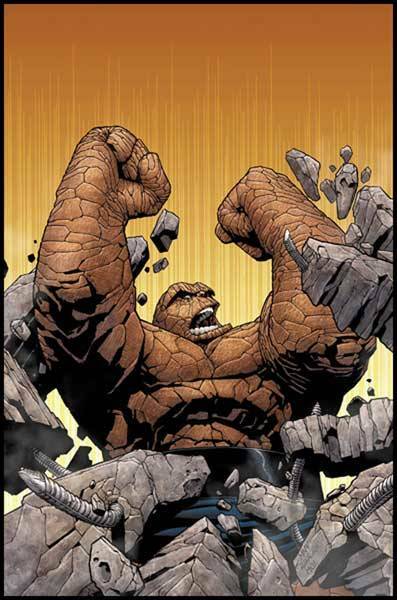 The Thing's highly advanced musculature generates fewer fatigue toxins during physical activity, granting him superhuman levels of stamina. When in his Thing form, he has only three fingers and a thumb on each hand. The loss of one digit on each hand, and the increase in volume of the remainder, does not affect his manual dexterity. However, he has been shown doing things like holding a pencil and using it to dial a phone (from stories during the era when rotary-dial phones were common), or to push buttons on a keypad, to demonstrate how he adapts to using devices that would ordinarily be too small for him. Aside from his physical attributes, the Thing's senses can withstand greater levels of sensory stimulation than an ordinary human, with the exception of his sense of touch. His lungs possess greater efficiency and volume than those of an ordinary human. As a result, the Thing is capable of holding his breath for much greater periods of time. Despite his brutish, even monstrous form, the Thing suffers no change in his personality nor his level of intelligence. 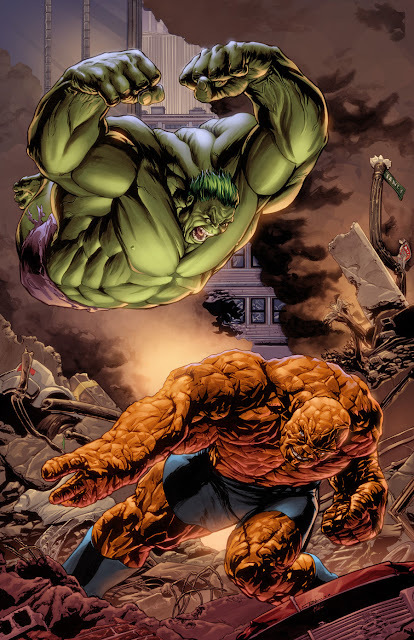 Despite his greatly increased size, the Thing's agility and reflexes remain at the same level they had been prior to his transformation. 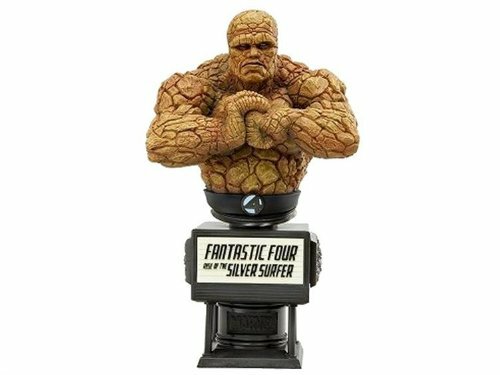 The Thing is an exceptionally skilled pilot, due to his time spent as a test pilot in the United States Air Force and as a founding member of the Fantastic Four. He is also a formidable and relentless hand-to-hand combatant. His fighting style incorporates elements of boxing, wrestling, judo, jujutsu, and street-fighting techniques, as well as hand-to-hand combat training from the military. After an encounter with the Grey Gargoyle, the Thing seemed to have gained the ability to shift between his human and rock forms at will. That ability has since been lost when it was discovered that he created versions of himself in other universes whenever he transformed. It has been revealed - after Franklin and Valeria created a formula that allows Ben to become human for one week each year - that Ben is almost immortal when in his Thing form, as he only ages when he is human, Reed and Nathaniel travelling over two thousand years into the future to see Ben still alive after all that time. Grimm's relationship with his teammates has been a close but occasionally edgy one given his temper. He and the Torch (aka Johnny Storm) are always arguing and have often clashed, causing no end of mayhem in the Fantastic Four headquarters. When Johnny started a relationship of his own with Alicia Masters and they became engaged, Grimm was upset. However, he had to concede that, unlike himself and his stone-covered body, Johnny could "be a man". He even agreed to act as best man at their wedding. The relationship between Alicia and Johnny was vehemently disliked by many fans, and was later retconned and explained that the Alicia that Johnny fell in love with was actually Lyja, a member of the shape-changing Skrull race. The real Alicia, who was kept in suspended animation, was soon rescued by the Fantastic Four and reunited with the Thing. Ben began dating a teacher named Debbie Green. Their relationship went so well that, after only six weeks, Ben asked Debbie to marry him, which she accepted. He later left her at the altar when he realizes the dangers of the wives of superheroes. Grimm calls Reed Richards "Stretch", as appropriate to the fact that he is naturally tall and can literally stretch his body. However, Grimm also holds Reed responsible for his condition since he had dismissed the potential danger of the cosmic rays that gave them their powers, although Grimm had taken them very seriously. At times of real frustration towards Reed, Grimm refers to him simply as "Richards". Grimm is the godfather of Reed and Sue's son Franklin, who affectionately calls him "Uncle Ben". The Thing is featured in the 2005 film released by 20th Century Fox, in which he is portrayed by Golden Globe-winner Michael Chiklis. In this film, a small explanation is given for why his physical alterations are the most severe, as he is exposed to the cosmic cloud with the least amount of protection, being outside the space station carrying out surveys while the rest of the team were inside. He is briefly cured of his 'condition' when Victor von Doom powers a chamber Mister Fantastic made that can negate the cosmic radiation that transforms him. After learning that Doom perfected the process so that he could drain the power of the Thing and use it to enhance his own, Grimm subjects himself to the chamber again so that he can turn himself back into the Thing. In this film, the Thing is from Brooklyn, rather than the Lower East Side. 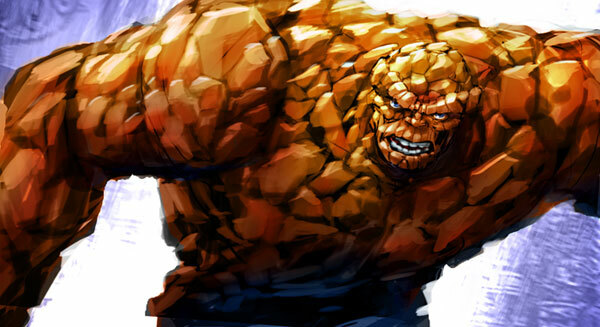 Chiklis reprises his role as The Thing in the sequel, Fantastic Four: Rise of the Silver Surfer in which he has mostly accepted his appearance. He briefly swaps powers with Johnny (Human Torch) to demonstrate Johnny's odd condition. When Victor shows himself Ben immediately charges him and threatens to break his neck. He is later one of three to let Johnny borrow his powers. On 31 August 2009 Fox announced a reboot of the Fantastic Four franchise.